Proudly sitting in the picturesque Hebridean Isle of Mull, Tobermory Distillery is the only distillery on the island and helps to give Tobermory Malt Whisky its smooth and lightly peated flavour thanks to the rich and aromatic peaty water that flows from the high hills above the distillery. 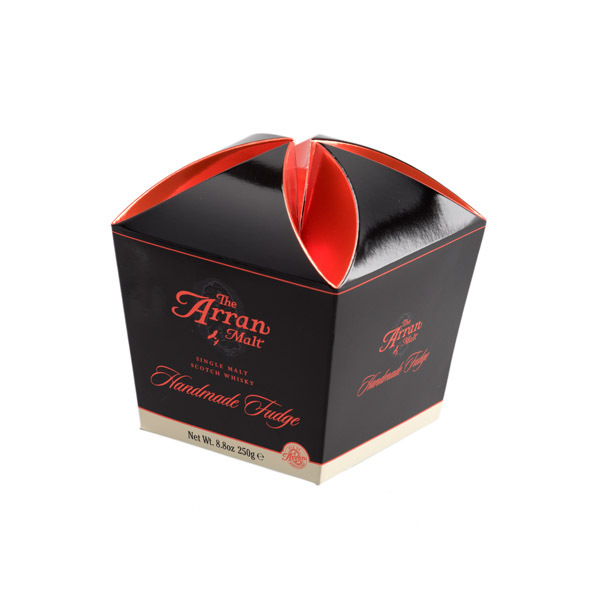 That smooth whisky flavour with Fruit Cake characteristics is perfectly captured in our very own fudge confectionery that is handmade to our very own recipe in the heart of recipe. Our Tobermory Malt Whisky Fudge comes complete in a decorative tin featuring imagery of the Isle of Mull, the home of the distillery. 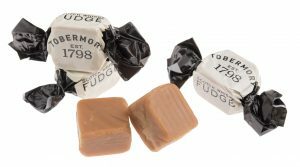 The perfect gift for a whisky enthusiast who wants the flavours of his or her favourite malt whisky perfectly captured in meltingly delicious fudge. Ingredients : Sugar, Glucose Syrup, Sweetened Condensed Skimmed Milk, Palm Oil*, Tobermory Malt Whisky (0.2%), Flavouring, Salt.